The Russians successfully carried out the first test firing of a hyper sonic version of Brahmos missile in Russia on last Thursday. Russian sources indicated that the test was successful and the missile flew at the speed of Mach 6. However, they didn't mention about the range and the mode of flight. Mostly it's believed flying in hi-lo lo mode with the range of some 300 kilometers. The test carried out from a land-based testing range, which could be followed by multiple launches in coming days, said a Russian official to RT.com, they also dropped a bombshell that the Zircon will be used to develop the Brahmos II missile. However, some other sources mentioned that Zircon missile is the Brahmos II. Russia planned to use the Zircon missile in its modern submarines, missile cruisers, and destroyers. the Zircon will replace the existing P 800 and Kalibr missile from the Russian naval ships. P 800 is known as the base model of Brahmos. There is no pictures or details available from the Russian media, except the missile test announcement. It's believed the development trails will be completed by 2018. and the Russian navy will start to induct the Zircon by 2019. The first Navy who get hypersonic missile's for anti-ship missions. There is no official press release or information available from the Indian side. 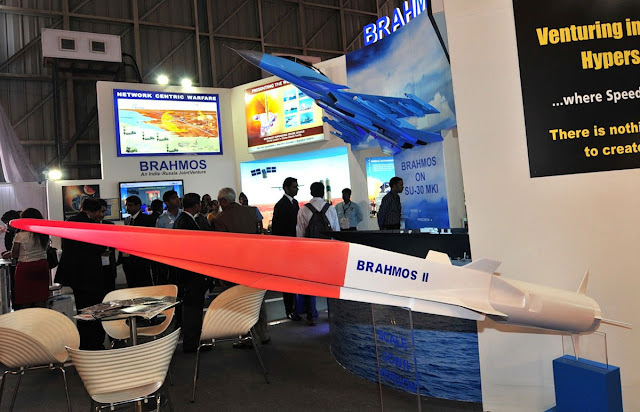 Brahmos corp involved in three bigger projects, one is the air-launched version known as Brahmos-A, 2nd is the Brahmos II hypersonic variant of Brahmos, three is the Brahmos NG who is a mini version of the Brahmos to be carried in small OPV's and fighter jets. Both Indian and Russian counterparts work close to achieving the above-said projects, In India they working on the Brahmos-A missile whose carriage trails scheduled by coming April, and in Russia they were working on the hypersonic variant with a Ram jet engine to boost the missile speed up to Mach 7. Brahmos corp, a joint venture company of Indian DRDO and Russian NPO, made the Brahmos missile from the base model of Russian Oniks missile. In Brahmos family, there were many variants, used for many missions, from anti-ships to steep dive mission. Indian Armed forces are the only user who uses the Brahmos variants in Army, Navy, and Airforce. while Russia yet to employ their naval ships with Brahmos missile. Brahmos used in the Navy ships usually to conduct the anti-ship and anti-surface mission with the range of 300 kilometers, and in lo lo mode the missile can strike targets up to 120 kilometers, during the lo lo lo mode, it's impossible to intercept the supersonic missile flying at Mach 3 speed. Indian army also uses the Brahmos in three variants block I, II, and III, those block versions are more advanced variants than its predecessors. The air force also operates a land-based launchers, air force operates one or two squadrons of Brahmos missiles.